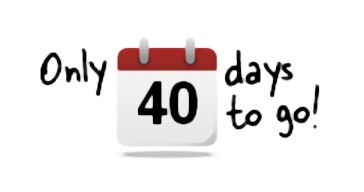 Including today, there are 40 days until the end of the year. When we look in scripture, we see that a lot can happen in 40 days. In Genesis, the first book of the Old Testament, it rained 40 days and 40 nights when the earth was flooding and Noah’s family was saved in the Ark. In Matthew, the first book of the New Testament, Jesus fasted for 40 days and 40 nights after being baptized by John the Baptist. Later He was tempted by Satan and resisted. If the world can be flooded and a new starter family saved or Jesus can fast for 40 days leading to strength over temptation, what could happen in our lives in 40 days. Why wait 40 days to set a new resolution or try to lose weight? Why wait 40 days to develop a debt reduction plan or get organized? Why wait 40 days to set goals or start forgiving? So much can happen in the next 40 days that set you up well for the next 365 days. New Year’s Day can be so much more fulfilling based on what you do in the next 40 days. Make a brief list of three areas you would like to grow in over the next 40 days. Invite someone to ask you about it weekly. Plan how you will celebrate your 40 day changes. Why wait? We can start today! Know that I am changing with you and rooting for you!